Habit: Annual <= 45 cm, scapose. Stem: 1, short, unbranched, generally not visible. Leaf: all basal, not fleshy, generally linear to oblanceolate, conspicuously long-hairy at base, lobes generally linear to thread-like, well-spaced. Inflorescence: heads 1 on long, +- naked peduncle; involucre generally 10--15 mm; outer phyllaries +- 1/2 inner, lanceolate, bases with long tangled hairs, mid-stripe +- red; receptacle glabrous or sparsely bristly. Flower: corolla 17--22 mm, generally yellow (white), ligules of outermost flowers exserted 11--13 mm. Fruit: 2--3.4 mm; outer pappus teeth irregular, bristles 2. Chromosomes: 2n=14. Citation for this treatment: W.S. 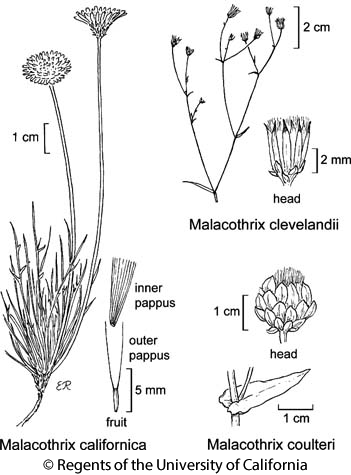 Davis 2012, Malacothrix californica, in Jepson Flora Project (eds.) Jepson eFlora, http://ucjeps.berkeley.edu/eflora/eflora_display.php?tid=4059, accessed on April 19, 2019.
s SNF, SnJV, CW, SW, D; Markers link to CCH specimen records. Yellow markers indicate records that may provide evidence for eFlora range revision or may have georeferencing or identification issues. Purple markers indicate specimens collected from a garden, greenhouse, or other non-wild location.